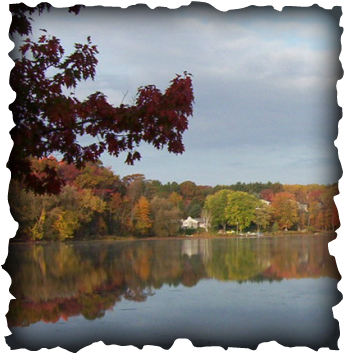 Welcome to the Hackert Lake Association Website! Riparians dedicated to stewardship programs for the health and safety of Hackert Lake. We hope you will find our site both informative and user friendly. Browse the page tabs above our banner picture to find the latest news and information, as well as some outstanding photos of our beautiful lake. We welcome comments, suggestions, and questions. This beautiful, natural lake of approximately 130 acres is located in Amber Township, Michigan, approximately eight miles east of Ludington. It is the only public access lake in Amber Township. 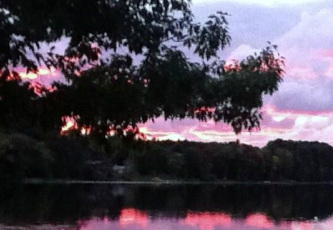 It has long been a popular all sports lake, known to many locals as Crystal Lake. The lake is noted for its exceptionally clear and healthy water quality. There is no inlet water flow or outlet, except for a high water drain. The west basin depth is approximately fifty (50) feet, and the East basin forty (40) feet. DNR regulations include no high speed boating between the hours of 7:30 pm to 11:00 am. The lake supports a healthy fish population, including large mouth bass, pike, crappie, bluegill, rock bass, perch,some walleye, and brown bullhead catfish. There is a desirable diversity of native aquatic vegetation. Hackert Lake Association has operated since 1984, and remains active in a wide range of activities to benefit the lake. A Lake Improvement Board was established in 2004 to allow funding for any needed projects. Beginning in 2005, the LIB has conducted two multi-year Management plans for the biological control of Eurasion Watermilfoil, an invasive species. The plans included surveys, and the planting of weevils, a harmless insect native to northern lakes, which decimate the milfoil. As of 2017, the milfoil is well under control. A water quality monitoring program has been conducted for many years by West Shore Community College. The annual program, which involves five monthly data samplings at each basin, has continued to reflect the excellent water quality. Hackert Lake Association, and the Lake Improvement Board are dedicated to preserving this wonderful natural resource for future generations. Thanks to Sandi Steckel for continuing to serve as the manager of our website Photo Gallery. Please contact Sandi if you have any extraordinary pictures of Hackert Lake and its environs that you are willing to share. in getting to know Hackert Lake.